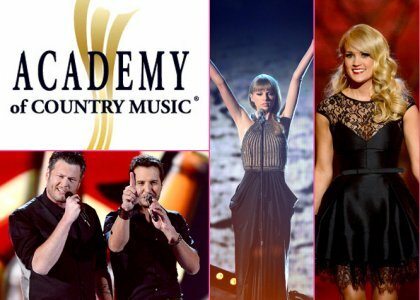 Bringing country's biggest stars to Sin City, the 2013 Academy of Country Music Awards are coming to an end in MGM Grand's Garden Arena in Las Vegas this evening (April 7). Helmed by hosts Luke Bryan and Blake Shelton, the night went off with a bang and included performances from celebs like Taylor Swift, Carrie Underwood, Eric Church and Lady Antebellum. The big winner of the night was Luke Bryan taking home the Entertainer of the Year award, while Jason Aldean took home Male Vocalist of the Year and Miranda Lambert scored Female Vocalist of the Year. In addition, Little Big Town proved victorious in the Vocal Group of the Year category, while Eric Church took home the trophy for Album of the Year.